Now that I have your attention, you should know that I’m not referring to your average beer, average babe or average vegetable! I’m talking about local hand brewed ales paired with several courses of organic local foods that were grown by female farmers right here in Georgia. This Saturday, September 18th we’ll be at 5 Seasons Restaurant and Brewery in Alpharetta for a very special event they are calling “Fall in Love With a Female Farmer Beer Dinner”. Each course will be paired with one of their hand brewed ales and all of the food served will have been grown by local female farmers, many of whom will be attending. So plan on coming out to chow down with us and hear about some of the amazing farms in the area! Check out the 5 Seasons website to find out more and reserve your spot. Just down the road, about 40 miles from rockstar farms, lies the quaint yet progressive small town of Athens, GA. 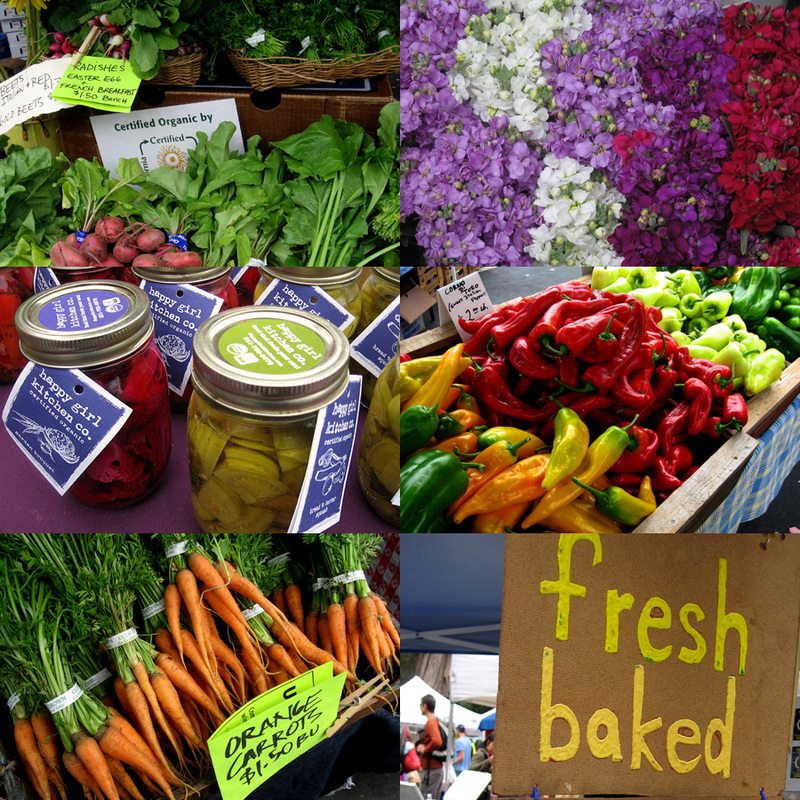 In recent years, Athens has quickly become known for its abundance of small local farms; farms that produce everything from fresh milled grains to grassfed beef, wild turkeys and just about every vegetable imaginable. A few short weeks ago a group of bicycling foodies got a unique oppportunity to visit, learn about and enjoy the fruits of labor from these farms – CNN was along for the ride. On April 30th, 30 cyclists parked their cars at the UGA Poultry Center and tuned up their bikes for a 3-day, 100-mile ride to 7 farms. The first day saw us at Woodlands Gardens where Celia showed us around their pristine intensively managed operation. Next, we headed to Mills Farm for lunch and an introduction with Luke the mule, who plows the field and grinds the grits that Mills Farm is so famous for. We ended Friday at Sundance Farm, greeted by the smiling faces of the Janosik family. With approximately 35 miles under everyone’s belt, we were treated to a delicious meal prepared by Peter Dale of the National using produce harvested just feet from were it was served. Everyone set up their tents and settled in for the night with roosters for alarm clocks. Nope, I am absolutely not talking about football. Not that there is anything wrong with football, its just a little early in the year for that particular type of tailgating. I am talking about local tailgate markets where farmers and artisans come together to lay out their wares for purchase. Tailgate markets are a wonderful way to suppport your local economy, purchase some of the absolute best produce and meats you could imagine and meet the people who grow and care for your food. This year Rockstar Farms will be selling our produce at the Whistle Stop Farmers Market in Norcross every Tuesday from 4-7 beginning June 1. We’ll even have the Tree Sound mobile solar rig and live music from our own Farmer Phatty on several dates including the opening day. We hope you’ll come out and help support those hardworking farmers like us. And if you are too far from the area or can’t make it on a Tuesday, I’ve listed some of our favorite tailgate markets in the area. Take a gander and make a plan to get to one of these amazing events. We promise…you will LOVE it! Paul Diaz, founder of both Tree Sound Studios and our beloved Rock Star Farms talks to planet harmony about the environment, hip-hop and being a beet farmer. Hip-Hop and environmental action. Tree Sound Studios in Atlanta combine both, so listen up. The Press Release is Finally Done! Well, we have been working the farm for almost a year now and thought it was about time to officially announce the launch of Rock Star Farms, by issuing a good old fashioned press release. And…don’t you know it, Southeast Green picked it up right away. Check it out ya’ll. 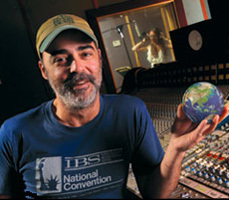 Tree Sound Studios has earned the reputation of being one of the greenest full production recording studios in the U.S. As if the biodiesel fueling station, organic studio garden, rooftop solar array and 100% carbon offsetting were not enough – owners Paul and Sunshine Diaz have now added a full scale organic farm to their list of green endeavors. Appropriately named, Rock Star Farms is located 45 minutes north of Atlanta in Gainesville, Georgia. Founded on Tree Sound’s progressive values, Rock Star Farms uses music as its igniting force aiming to educate the global community on local foods, family farms and the benefits of living a truly sustainable lifestyle. 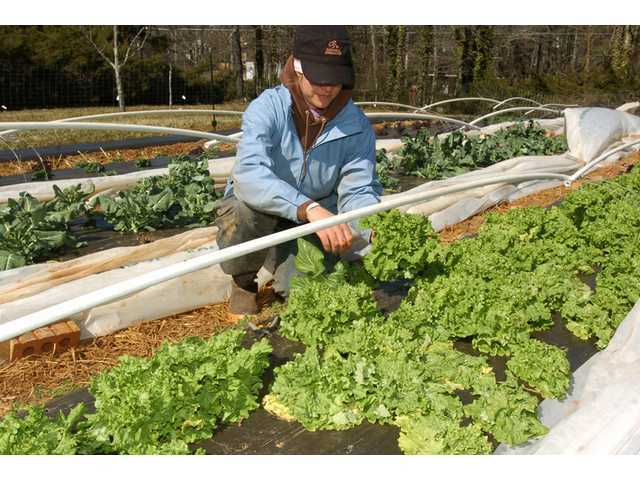 In March of 2009, Paul and Sunshine Diaz made the decision to realize their dream of producing their own food on their own land. After calling upon a few good friends of like mind to assist in the everyday labors of farming and utilizing their relationship with master gardeners Laura and Jimmie Hendricks of Denali Organic Growers – they put their first seeds in the ground and called it Rock Star Farms. Rule number one in gardening….JUST DO IT! If you’ve ever been too timid to put a particular vegetable in the ground, don’t be. There is a ton of information out there on the internet and plenty of seasoned gardeners and farmers who are more than willing to pass on valuable information…like us, here at Rock Star Farms. It wasn’t too long ago that I was just plain scared of planting something like an onion because I had no idea how to do it – what type to choose, where to plant them, how to care for them…the excuses just went on and on. I’m thrilled to say, thanks to my experience here on the farm and priceless guidance from a variety of seasoned farmers, these fears are slowing being erased. Back in late January we selected several varieties (yellow granex, first edition, candy, red candy apple and copra). All in all about 1,000 little seedlings went into the bed. Unfortunately we had some pretty severe weather that wiped out a little under half of what we planted, but we still have over 500 onion plants growing strong that will be ready for harvest in the next couple of months! So, no matter what you want to start planting this spring, don’t let fear of the unknown stop you and always plant more than what you want because there inevitably will be casualties. If you want some quick tips on growing onions, click here. And as always, thanks for checking us out and HAPPY FARMING! 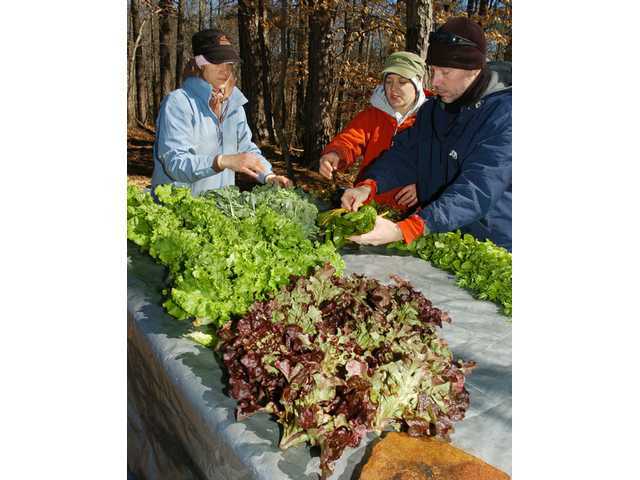 Sunshine Diaz, left, Amy Senn, center and Patrick Stacey lay out produce as they prepare to put together CSA packages at Rock Star Farms in Forsyth County. When the Gainesville Times called last Wednesday to request a tour of the farm and an interview, we were happy to accommodate. They had been pointed in our direction by Georgia Organics, who this past weekend, hosted the Georgia Organics Conference in Athens where hundreds of farmers and garden enthusiasts gathered to network and participate in educational workshops. 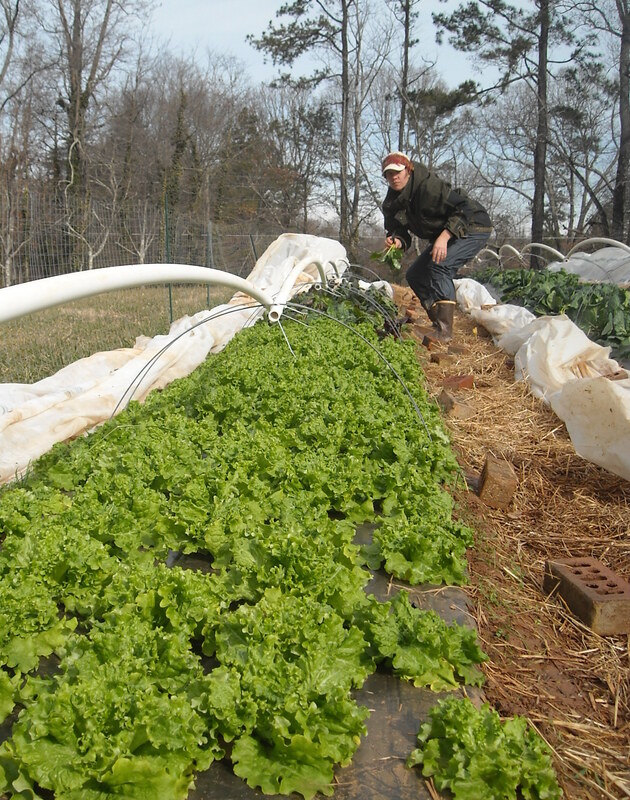 Sunshine Diaz, owner of Rock Star Farms in Gainesville, has hope that the Georgia’s attitude toward small and organic producers will change. Diaz and her husband, who have been involved with Georgia Organics for the last three years, started their own naturally-grown produce farm near Browns Bridge Road last summer. “I think the more we have local farms, the more we empower our communities, and there’s nothing you can do to stop that once it gets started. And it is started,” Diaz said. But Nashville-based goat farmer Tom Kuettner said he won’t be looking for any help from the state’s new ag commissioner. “I haven’t seen anything I like in the ag department,” Kuettner said. Still, he is looking for legislation that affects smaller farmers and those who cater to the emerging demand for local food. Visit the Gainesville Times to read the entire article. All images provided by Tom Reed of the Gainesville Times. Click here to learn more about Georgia Organics.